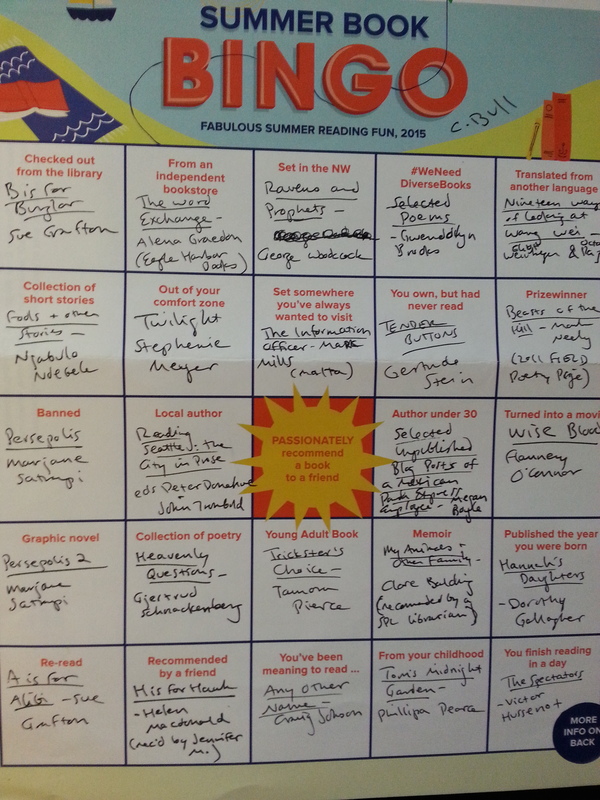 Last week I finished the last square on the Seattle Public Library’s Summer Book Bingo card and turned it in with one whole reading day to spare! A delightful summer of both more and different reading than I’d have done without that impetus. Plus! apparently I have a 1 in 197 chance at winning that prize the SPL and Seattle Arts & Lectures folks will be drawing for this Tuesday— season tickets to SAL + a library of books by the speakers. (And 218 bingos are in for the drawing for a gift certificate to a local bookstore.) It is such a delight to be living in such a book-centric city.